According to Mehta, A.T.E’s print and packaging business (PPE) unit is the only Indian manufacturer of register controllers for rotogravure presses. Register controllers have been the mainstay of PPE, however, new product additions include vision systems to monitor print during production runs. 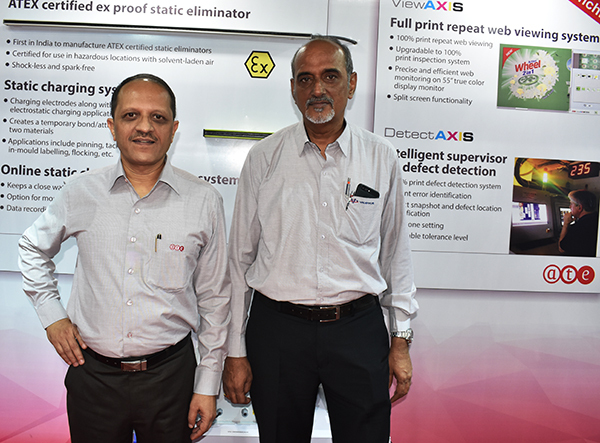 Mehta explained, “For rotogravure printers, either there is an entry-level web or a 100% print inspection system. Full repeat web viewing system, which could monitor full width of the web in real-time was a need for many years, particularly in the Indian market. The 55-inch 4K monitor displaying images of 50+ megapixels resolution results in near-print quality web visualization. The ViewAXIS Tera was an idea given by a few printers and OEMs. They asked if they could have an intermediate system which in later stage can be upgraded to a 100% inspection system. The advantage of doing this is two-fold – first, operators get to learn to identify the defects on a full print repeat monitoring system and second is the staggering investment for the business.” DetectAXIS, a 100% print defect detection system, quickly spots printing defects that are practically invisible to unassisted human eye in real-time by comparing the captured images with a golden template. When a defect is spotted, DetectAXIS generates an alarm, and the operator can take necessary corrective actions. DetectAXIS thus ensures consistent defect-free and high print quality material dispatch.